Museum-Ed has created a strategic plan for expansion into the future. Below is a two-page summary of the plan. Download a pdf of the 2012 Strategic Plan Summary. Museum-Ed is a virtual community where museum educators and anyone interested in museum education may ask questions and immediately pursue solutions, exchange ideas, explore current issues, share resources, think about their work, and find inspiration for new directions. Museum-Ed allows participants to connect personally and professionally with museum educators in the United States and internationally. Museum-Ed serves two sets of constituents: stakeholders who are potential participants, supporters, individual museum educators and anyone interested in museum education, and participants who are self-motivated museum educators and others whose interests lead them to contribute content of any sort to the Museum-Ed community. 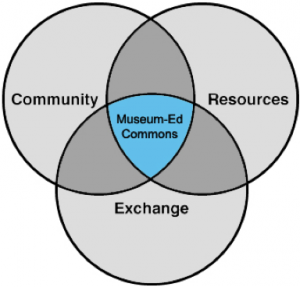 Create a vibrant commons that enables museum educators to thrive. Strategic Goal: Increase Museum-Ed’s visibility among its audience to provide as much access as possible to anyone interested in participating in the community. Strategic Goal: Enhance and sustain the dynamic, community-driven and edited virtual framework of Museum-Ed. Strategic Goal: Advance a mixed model for gathering content knowledge in the commons that includes community contributed content and proactively collected and edited content. Strategic Goal: In alignment with its qualities and values, establish a budget and revenue model that generates sustainable operational funding as well as project funding by drawing in-kind and donated support from the Museum-Ed community and stakeholders with complementing revenues through grants and other miscellaneous sources. Strategic Goal: Establish a nimble, flexible, and diverse operational and governance structure that includes paid staff, contracted experts, contributed expertise and work from community members, and also allows for ad-hoc self-organization within the community.